Rev Fran: "Commandments of Freedom." A Sermon from Littlefield Presbyterian Church on the Third Sunday in Lent. "Commandments of Freedom." A Sermon from Littlefield Presbyterian Church on the Third Sunday in Lent. 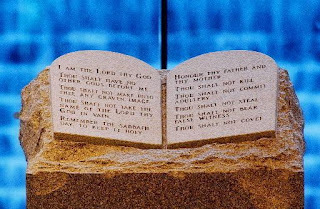 In 2001, Alabama Supreme Court Justice Roy Moore had a Ten Commandments monument installed in the rotunda of the Alabama Judicial Building, without the knowledge of the other justices. This resulted in a legal battle over establishment of a particular religion in a government building and eventually to his being removed from office over his refusal to comply to the federal court injunction. Eventually, the monument was placed in a storage room, and later it was taken on a flatbed trailer on tour by a group called “America for Jesus.”. There was controversy between a those who thought that was a good idea and those who saw it as worshiping a graven image, a form of idolatry. What I hadn’t thought a lot about at the time is how much this monument weighed: 5,280 pounds. That’s just over 500 pounds per commandment. As Tom Long suggests, in the popular religious consciousness, the Ten Commandments have come to represent, for some, weights and heavy obligations. 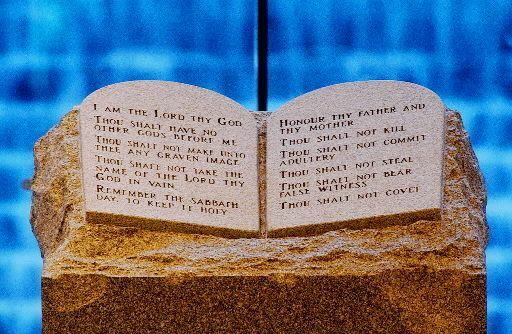 Most people in our society would have a hard time naming all ten commandments, but they may still think that the Ten Commandments are about finger-wagging “thou shalt not’s.” For some others, the commandments are heavy yokes placed on the necks of a rebellious society. As Tom suggests, a two-and-a-half-ton rock sitting on the bed of a truck is a perfect symbol of this. This was God’s direct address to the people of Israel: “God spoke all these words.” “Words” -- not commandments. So, it is really more accurate to speak of them as “the Decalogue” -- the ten words. “Because the Lord is your God,” the Decalogue affirms, “you are free not to need any other gods. You are free: free to rest on the seventh day…free from the tyranny of lifeless idols… free from stealing and covetousness as ways to establish yourself. The Decalogue begins with the good news of what the liberating God has done and then describes the life of freedom that God desires for people. “I am the Lord your God who brought you out of the land of Egypt, out of the house of slavery.” Although this introductory sentence of freedom and redemption is often left out of printed versions of the Ten Commandments, in Judaism it is recognized as the first word. The Ten Words we heard in today’s lesson were not new for Israel, but they were a good listing for their time and situation, when the newly liberated people of Israel were wandering around in the wilderness, learning how to be free people. The Ten Words were adapted at different times and places. That’s why when we compare the Ten Commandments in Exodus and the Ten Commandments in Deuteronomy, we see some differences that reflect some changes, such as a changing role for women in the culture. “I am the Lord your God, who brought you out of Egypt, out of the house of slavery.” The Ten Words had been given to the people to celebrate and maintain their emancipation from Egypt and the Pharaoh. In the Pharaoh, the ruler of ancient Egypt, was a brutal concentration of power and wealth. Walter Brueggemann has often pointed out how every time a “Pharaoh” turns up in history, it turns out that this empire is propelled by a sense of not having enough, a system designed to accumulate more and more--more money, more power, more land, more food, more cheap labor for the ruler.. When Pharaohs--or tyrannical emperors or kings or dictators-- rise up in history, they act in violence against vulnerable, disadvantaged people. The Exodus from Egypt and the celebration of Passover is a powerful demonstration of how God broke in to liberate the people from their oppression, and to give them a life of freedom. But it becomes clear that we don’t always know what to do with freedom. There were times in the wilderness when the people of Israel when they grumbled and wished they could go back to slavery in Egypt. So, Brueggemann says the Ten Commandments “are nothing less than strategies for staying emancipated in the new life that the God of Sinai governs.” These strategies are urgent, he says, because Pharaoh, in a variety of forms, always wants to coerce us back into Pharaoh’s domain of exploitation. The season of Lent calls us to a reality check. Moses, through the Ten Commandments, or Ten Words, at Sinai, declared new possibilities for a life of freedom, outside the oppression, anxiety, fearfulness, and scarcity under Pharaoh-- a new life that honors God’s holiness, that loves the neighbor in concrete ways, and that honors the Sabbath and makes time to be holy. Lent invites us to look honestly at the ways in which we have failed at living freely. We’ve heard Pharaoh say, “Be very afraid,” and lived anxious lives. We’ve believed what those in power tell us about scarcity, so we’re afraid we won’t have enough and accept that the poor can’t have what they need for lives of dignity. We hurry to try to keep even, and are over-extended and exhausted. The season of Lent is a time for us to ponder the gospel life to which Jesus calls us: an alternative life that is unafraid…a life of abundance Jesus showed us when he multiplied loaves and fishes to feed the multitudes. Jesus calls us to a life of healing and forgiveness and generosity to neighbors. The season of Lent reminds re-presents the outrage Jesus demonstrated at what he saw in the Temple and how he challenged the status quo. It reminds us how determined the empire and the keepers of the status quo were to maintain their power and privilege and control, to the point of executing Jesus on the cross where his followers and other would see him being tortured. “You destroy this temple… in three days I will raise it up.” Even the disciples couldn’t understand Jesus’ words until after the resurrection. The story of Jesus doesn’t end at the cross. Only after the resurrection can we reflect on what the cross of Jesus means for a life of faith. The powers of this world will tell us that it is foolish to think we have enough to feed a crowd… and that it is a sign of weakness to practice mercy, justice, and faithfulness. But we can trust that God’s foolishness is wiser than human wisdom, and God’s weakness is stronger than human strength. Thomas G. Long, “Dancing the Decalogue,” in “Living by the Word,” in The Christian Century.